Tableau Software emerged from scientific research at Stanford University, where its three founders pursued a vision of providing business users with software that allowed intuitive analysis and insights into data. Tableau’s substantial growth seen in the years since its foundation in 2003 slowed down to 6 percent in 2017 due to an increased focus on subscription licenses. Tableau has been listed on the New York Stock Exchange since 2013. The vendor has invested increasingly in internationalization for some years now, but the US and Canada still account for 69 percent of total revenues. Its corporate headquarters is in Seattle (US) and the EMEA headquarters is in London (UK). Tableau Software has offices worldwide, with some of its branches still operating as pure sales offices. Tableau Platform is the common technology supporting four major products: Tableau Desktop, Tableau Prep, Tableau Server and Tableau Online. This review does not focus on Tableau Public due to its limited relevance for enterprise use. Tableau follows a strategy of delivering software that requires as little training as possible and allows business users to analyze data through visual analysis without having to rely on the assistance of BI developers. The tool offers additional analysis capabilities specifically geared to analysts for in-depth analysis such as predefined statistical functions and data preparation capabilities. The company pursues a “land and expand” strategy with a focus on business users, popular with other self-service BI vendors too. Tableau offers a free software known as Tableau Public in addition to trial versions of Tableau Desktop and Tableau Prep. Anyone can use Tableau Public to visualize data and publish it to the Tableau Public cloud. Visualizations can be embedded into websites with complete interactivity retained (e.g., for data journalism or blogging). Tableau’s initial products were Tableau Desktop and Tableau Server. Tableau Desktop is the main authoring software, supporting the user through all steps of the analytics cycle (from data to insight). Tableau Server is the web and mobile-enabled dashboard publishing and collaboration environment. 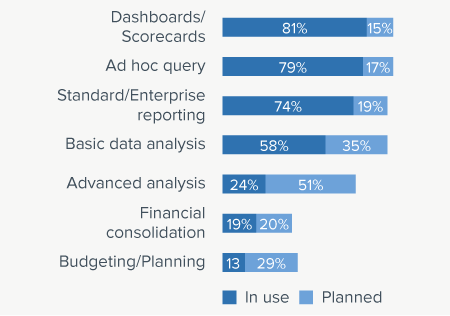 With this architecture customers typically have a small share of developers (power users) and a larger share of casual users who consume reports, dashboards and analyses. Furthermore, Tableau has many reference customers for deployments supporting thousands of users. Tableau Online is the multi-tenant cloud solution, which is the hosted version of Tableau Server. The product works with on-premises as well as cloud data sources. It is typically used for analysis scenarios without IT involvement or sharing analysis results with users outside the firewall. Tableau has various types of technology partners. It partners with database and application vendors such as SAP, Cloudera, Salesforce.com and others by building native connectors to these systems. Partnerships with companies like Informatica and data preparation vendors such as Alteryx support customers’ data integration needs. Tableau partners with specialists to extend the product’s capabilities (e.g., with Datasift to provide social sentiment analysis). Finally, Tableau can connect to R, Python, SPSS and SAS data sources for advanced analytics (e.g., cluster analysis, decision trees). Tableau has a proven client-server architecture based on optional, proprietary columnar and optimized data storage. The in-memory engine Hyper was introduced in version 10.5 to speed up extract creation and analysis. The core authoring component is Tableau Desktop, but features are increasingly incorporated in Tableau Server, offering simple data preparation over the web since version 2018.1. Advanced and better guided data preparation are done in Tableau Prep, also introduced in version 2018.1. Tableau offers connectivity to an unrivaled number of sources with over 60 data sources available in Tableau Desktop. Some are Windows only and others are not supported in Tableau Prep yet. In addition to relational and multidimensional databases, on-premises and cloud business applications can be accessed. Tableau is also capable of integrating local files with capabilities to parse and import data from tables in PDF. Functions for parsing and automatically cleaning Excel files to speed up importing are included as Data Interpreter. There are functional differences when connecting to data sources due to the underlying language differences between MDX and SQL. As a result, some features are not available when connecting to OLAP data sources but are available when connecting to relational data sources and vice versa. Data source definitions can be re-used or published on the Tableau Server. Tableau has two different ways to connect to data sources: “Live-Connect” leaves data in the underlying data store and queries the data at runtime. In this case, Tableau acts as a pure front-end analysis tool and does not store the data. The second and much more common option is to use Tableau’s own and new data storage facility Hyper to create optimized extracts and to load data into memory. Using a Hyper extract is beneficial when the underlying database is slow, if a user wants to reduce the load on the underlying system, or when a user wants to work with data offline. Offline read access is possible via a free Tableau Reader that offers users access to interactive analyses and dashboards. Tableau Server is the solution’s application server and acts as a central repository and portal for all Tableau metadata concerning users, data connections and content. Tableau Server administrators can perform tasks such as refreshing data sets and managing users and published content. Metadata is stored in an internal PostgreSQL database. Tableau Server also allows users to consume and interact with and even modify published visualizations on their web or mobile clients. In addition to Tableau workbooks, dashboards and views, users can also access published Shared Data Sources to create new analyses. In version 2018.2, administration via the browser was introduced with Tableau Server Manager (TSM). 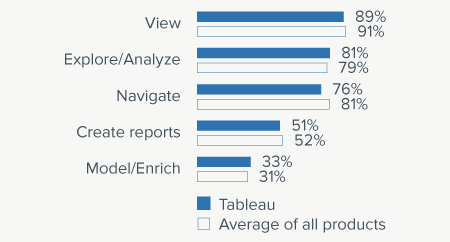 Most Tableau users are non-technical business users rather than data scientists or BI developers. Data access and preparation are performed in Tableau Desktop, or increasingly Tableau Prep, using a graphical interface with built-in intelligence to assist users. Tableau automatically recognizes data types and creates hierarchies for date fields. Tableau’s primary focus is interactive and intuitive visual analysis to efficiently dissect data and find patterns. Entities such as measures and dimensions are selected via drag-and-drop for analysis and visualized instantly in interactive visualizations. Users are guided by the software with functions such as “show me”, which proposes appropriate visualizations for any combination of data fields selected. The tool offers additional grouping and calculation options supported with context-sensitive wizards besides the creation of hierarchies. For example, a user can select entities on a visualization to create sets and to group based on common features or attributes for further analysis. Tableau’s calculation library’s analytical feature set ranges from simple trend to smoothed forecasts, table calculations and other analytical and statistical functions such as cluster analysis. Visualizations reside in individual sheets in Tableau much like the sheets in an Excel workbook. To create a dashboard, the user drags the desired worksheets from a shelf onto the dashboard canvas and rearranges the visualizations. Users can extend the information on a dashboard by linking to further information on the web via a “URL action” or dashboard extensions introduced in version 2018.2. Tableau also possesses a parameter and global filter concept, which allows dashboard consumers to intuitively filter the data displayed to a specific range. Tableau also offers features for data-driven alerts and custom content subscription. Visualizations and dashboards are optimized for screen display rather than for printing. Tableau offers limited functions to specify page formats and control printer output. Printing takes place according to the WYSIWYG principle. Workbooks can be printed out or exported to PDF, Excel and CSV, distributed as files via email or URL, or embedded into a website or portal. In Tableau Server, users can collaborate and discuss content via comments, annotations and dashboard web page objects. Fields can have comments that describe them. Annotations can be used to call out a specific highlight such as a value on an axis or a reference line, or an area such as a cluster of scatter plot dots, which is important especially when compiling data stories in the relevant storytelling section. Conversations and annotations can be shared on Tableau Server alongside the applicable visualizations and dashboards. Tableau is quite popular in medium to large enterprises with average sized deployments. It shows the increasing importance of viewing standardized content such as dashboards and formatted reports and a decreasing use of basic analysis. Tableau deployments are maturing and serve a growing share of content consumers. 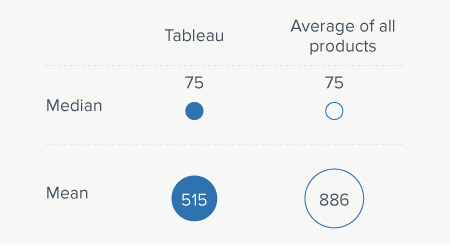 But still, Tableau is used to prepare and analyze data more frequently than the average of all products in this year’s BI Survey. BARC’s Vendor Performance Summary contains an overview of The BI Survey results based on feedback from Tableau Server and Tableau Desktop users, accompanied by expert analyst commentary.